I read on Oracle blogs about an install error - the "PSDMTX Error"
"SQL Server 2008 seed creation, WebLogic done, Tuxedo is done"
Could you please provide your useful expertise? Can you post more the PSDMTX error you are getting - in particular are you logging in as an ordinary PeopleSoft user or in bootstrap mode. Also, have you tried a trace to find out more about the error? starts and DMover window tries to do the .dms operation(s) automatically..
And the logs say the same - " PSDMTX error - signon"
me login manually to data mover to run.dms in addition! I think your access ID might be incorrect - shouldn't that be your database schema owner (sa) and password? "changing from 64 bit to 32 OS bit"
restart the installation process over again after a thorough data cleanup. It seems to be a GUI installer bug as I had read once on an Oracle blog. I shall post the link here if I come across that blog soon. This time same access id did work out so I concluded. Also, you can direct anyone wanting to install PeopleSoft Financials 9.1 & Tools 8.51 on Windows 7 32 bit, MSSQL Server 2008 to me and I can try to tell how I managed to complete it. Thanks for posting the update and useful information. Hi.. I'm also facing the same PSDMTX: error sign on . Trying to install on same infrastructure… Please can you let me know how did u resolve this.! Which platform are you using (OS and DBMS) including architecture (32 or 64 bit)? Is this when connecting in bootstrap mode (database user) or normal mode (PeopleSoft User)? 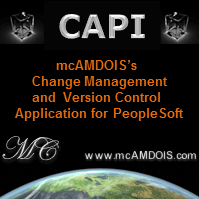 Copyright (c) 2012 PeopleSoft, Inc. The following error occurred while running data mover . Please click Next to exit. what shall be the solution?.. Are you able to login to data mover in bootstrap mode with your system database credentials e.g. sysadm (Oracle) or sys (MySQL)?